What do you get when you cross a well-planned living space with a lightweight bunkhouse camper? You get the Keystone Bullet! While some other manufacturers seem to struggle with the concept of creating optimized, truly livable floorplans in an RV, Keystone has built their reputation on it. In the process, they’ve built severalhighly livable bunkhouse models, all within a lightweight shell. For this review, we’ll focus on Keystone’s Bullet 311BHS and Bullet Premier 34BHPR models. 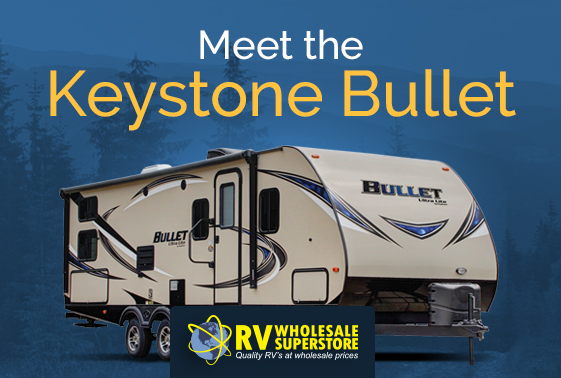 New 2013 Keystone Bullet Model 230BHS Is Waiting for Its New Owner! One of the most affordable and iconic of recreational vehicles, the Keystone Bullet RV travel trailer has a storied history and plenty of love from the public due to its great looks, fun features and ease-of-use. Go to any RV park or campground and you can be guaranteed to spot several Bullets among the newer, more expensive RVs that are traversing the highways and byways of America these days. But why pay more when you can have the Bullet for less?